Everyone needs to use a heating pad at some point, whether it’s to help treat a sports injury or just to help ease the pain and stiffness in your muscles after a long day. Not all heating pads were created equal, though, so in addition to some tips on what to look for, we’ve compiled a list of the best heating pads on the market to help you find the right one for you. 1. What You’re Intending to Use It for – There are many different types of heating pads, so it’s important to pick a heating pad that will help ease your current discomfort. 2. The Environment You’ll be Using Your Heating Pad in – Are you going to be relaxing at home, or do you need something more portable? There are a variety of choices for both circumstances, so be sure to pick one best suited for your needs. 3. Safety Issues – When deciding on a heating pad, it’s important to consider all potential hazards or risks. Be mindful when picking a heating pad, and be certain that you can handle and use it safely without risk to yourself. As with all important purchases, make sure to think over all these things before deciding on which heating pad to buy. The Sunbeam Renue Heat Wrap has four heat settings, will turn off automatically after two hours, and is even machine washable! It’s unique design and magnetic clasps allow you to wrap this product comfortably around your shoulders without needing to worry about it slipping or falling off. The only real catch is that anyone with a pacemaker, ICD, or Internal Insulin pump will not be able to use this product, because of the magnets present. There are also some customer reports of the heating pad losing its ability to remain hot after a year or more of use. The Duro-Med TheraBeads Pad utilizes a unique method of providing therapeutic heat without the use of electricity or heated water. The revolutionary beads within the product absorb moisture from the air, and the pad can be easily heated up in the microwave; it usually takes only about a minute to get it to the desired temperature. This pad is a particularly good choice if you need to apply deep heat to your shoulders or back. On the downside, this pad is fairly firm, so bending it to fit the smaller contours of the body can be difficult. Also, it can be re-heated only once an hour, and if it’s put in the microwave for too long there is a risk of the pad bursting open. There are also reports of the pads not retaining heat for very long. Another delightful product from Sunbeam, this pad is unique in that it’s meant to be used on your bed, to provide heat and relief to your whole body. With ten heat settings and an automatic shut off after ten hours, this is a good choice if you need consistent heat throughout the night, whether it’s to ease your aches and pains or just keep toasty warm in the winter. And not only is it machine-washable, it also has a controller for each side of the bed! However, there are some reports of one side of the heating pad becoming less effective after long periods of consistent use. Also, if the pad is not plugged into an outlet that provides enough electrical power, it will not work correctly. 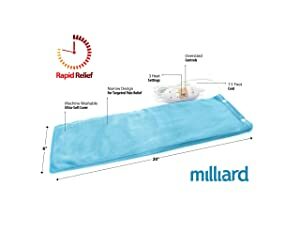 The Milliard Electric pad is the most common type of heating pad, but that’s no reason to dismiss it! 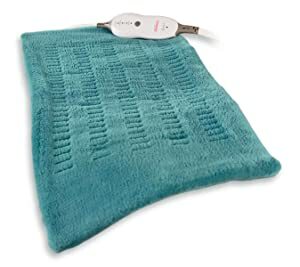 Many people prefer this variety of heating pad because of how easy they are to use. This pad has three temperature settings and three timer options. It also has an an extra long cord (seven and a half feet! ), and the removable cover is both soft to the touch and machine-washable. This pad is a good choice if you want to get the job done without spending too much money on a fancier option. Unfortunately, it is a little narrower than other heating pads, at just 6 inches across. There are also some customer reports regarding a short life expectancy for the product, possibly due to over-use. The Natural Creation set is a good option if you’re looking for something of a more organic nature. 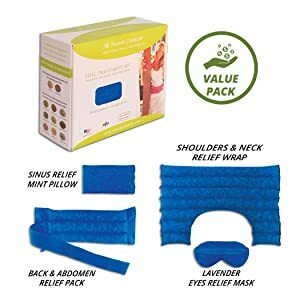 The Ultimate Set includes the company’s top four best-selling pain relief products: the Upper Body Wrap, the Spine & Back Pack, the Sinus Relief Mint Pillow, and the Lavender Eye Mask. The hot and cold packs in the body and back wraps are filled with specials blends of herbs and seeds, combining the benefits of both heat therapy and aromatherapy. They’re even eco-friendly and pet-safe! Basically, this a good choice if you want some stress relief with your pain relief. It’s also easy to use; all you need to do is heat the pads in the microwave for heat therapy, or chill them in your freezer if you need them cold. The main downside to this product is that it is more expensive when compared to other types of heating pads. Additionally, you can’t get the packs wet because it will damage the herbs inside. Also, if you are allergic to any of the herbs in the filling (chamomile, cinnamon, lemongrass, peppermint, rosemary, spearmint, yarrow, yellow-dock root, white willow, flax seed, and wheat), you won’t be able to use this product. Yet another product from Sunbeam, the Xpress is the perfect choice if you need relief immediately. Not only is it relatively affordable, but it heats up in thirty seconds on average. It also has six different heat settings, an automatic 2-hour shut-off feature, and a unique meter that can show you the progress as the pad heats up. And not only is it made of a soft micro-plush fabric, it’s also machine-washable! There have been some reports of these pads not lasting as long as some other varieties, but the product does have a five-year limited warranty in case there is a malfunction. Do be aware, however, that this product reportedly has a very short lifespan depending on how often it is used. 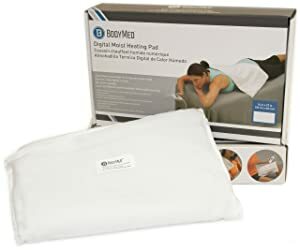 Another heating pad that draws moisture in from the air, the BodyMed pad is one of the most popular choices for those suffering from muscle aches, sprains, joint pain and inflammation, as well as general muscle pain and fatigue. Available in four different sizes, this pad has simple controls and a straightforward LCD display; additionally, the controls have a lock-out feature to prevent accidental temperature adjustments or tampering. The automatic shut-off period is fifteen minutes by default, but can be adjusted to allow for up to an hour of use. The main drawbacks of this product are the shorter automatic shut-off period, the LCD display not lighting up when in use, and the beeping noise that the controller makes, which can be quite loud. If you need a hot pack for a busy lifestyle or on the go, this is the perfect choice for you! Not only is it great for easing muscle pain and soreness after outdoor activities or while traveling, it’s also eco-friendly and extremely easy to use. All you need to do is boil it briefly, and then you’re good to go! 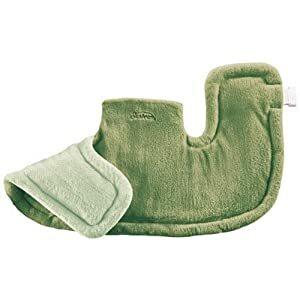 There’s even a Buy 4 Get 4 For Free deal on these nifty re-usable heating pads, along with a 90-day satisfaction guarantee just in case they’re not to your liking. 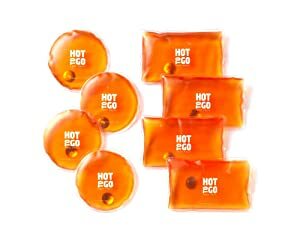 There are very few problems,with these hot packs, but depending on your environment the heat within them may only last 20 to 45 minutes, so if you need a hot pack that works for a longer period of time this might not be the right choice for you. There are, however, three drawbacks: the small disk within the packs that activates the heat needs to be clicked very firmly, the packs are not always effective as hand warmers because of the slightly too-large size, and they stay hot for only about 20 – 45 minutes. Knee injuries are among the most painful and the most frustrating ailments for everyone, so it’s important to have a good brace to help you on the road to recovery. 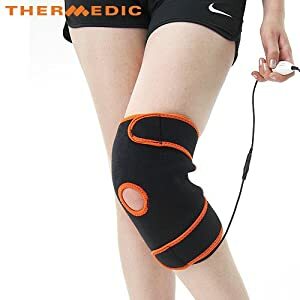 This Thermedic 3-in-1 Brace is not a heating pad precisely, but it is definitely a good choice if you need hot or cold therapy for your knees specifically. It is a good choice for both acute and chronic knee pain, and is specially designed to have both hot and cold treatments while also bracing and supporting your knee. It has a hand-held controller with three temperature settings and an automatic 30-minute shut-off. The design of the brace is both ergonomic and breathable, allowing for both support and comfort. Some customers do report that the brace is a bit smaller and tighter than expected, so keep this in mind, particularly if you recently had surgery done and need a looser brace for your knee. 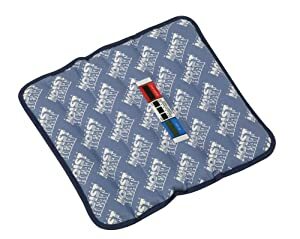 This pad is a great choice if you want a heating pad that is both effective and luxurious. 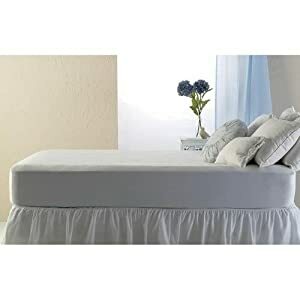 Not only does the cover utilize a unique design with micro-plush on one side for comfort and SoftTouch polyester on the other side for optimal heat, but it also has an digital controller with four heat settings and an automatic shut-off period of two hours. The main downside to this option is that the return policy only applies to the first thirty days after purchase, so if the product malfunctions after that point, you may have difficulty getting your money back. A heating pad is, by standard definition, a pad used for warming parts of the body in order to help alleviate pain or discomfort. Heating pads work by helping to cause dilation in the blood vessels of the area in question, increasing blood flow to the affected area. And not only do heating pads come in all shapes and sizes depending on your needs, but they also implement different methods of heating up for use; most heating pads are electrical, chemical, or microwaveable. The benefits of using a heating pad are pretty much self-evident; the heat therapy can ease pain, soreness, and stiffness in your muscles and joints by increasing blood flow through the use of heat. And not only does the heat help ease the pain, but increasing the blood flow also increases the amount of nutrients flowing into the afflicted areas, which helps to heal damaged tissue at a faster rate. Do be aware, however, that heating pads carry some risks. As with all appliances, it’s important to read the instructions that come with the product, so that you can operate it safely and effectively. Also, be careful when using a heating pad during a pregnancy.While heating packs are safe to use on aching joints and your lower back, limit your use to twenty minutes. Additionally, make sure to never place a hot pad directly on your abdomen when pregnant; the temperature increase can harm your developing child. Do not exceed recommended time limits when using a heating pad; generally, it’s advised to use a heating pad for not more than 15 or 20 minutes once an hour. Unless your heating pad is specifically designed for long periods of use, do not fall asleep when using it; this can lead to burns. Do not use a heating pad after applying lotions or ointments (such as Bengay). Be very careful when applying a heating pad to an area of your body that does not have full feeling, since this could lead to burns or injury if you cannot properly feel the heat being emitted from the pad. If you have an acute injury less than 3 days old, it’s advisable to use cold treatments rather than heat packs, unless otherwise advised by your doctor. Avoid lying on top of a heating pad unless it was designed for such an activity; doing so on a heating pad not intended for such use can lead to burns and additional discomfort or injury. We hope that the information we’ve provided in this article will help you to make the best decision possible when purchasing a heating pad of your own. As with all purchases, don’t be afraid to do additional research before investing in a product; this is especially important in situations such as this where your health is concerned. It’s better to take your time and get the perfect heating pad than to buy one on a whim and regret it later. Make sure to buy a heating pad that suits your needs and wants, whether it’s for helping an injury or easing the chill of a winter night. Happy shopping! Infrared heating pad is good for any kind of body pain though the price is little costlier than the normal electric heating pad. Some of them are very good sources of negative ion as well. Thanks, I will look that up. I am having trouble finding a pad that heats well, stays hot and doesn’t have other negative issues. With the number of heating pads being sold on the market, it is very difficult to determine which are the best among all of them. With these kinds of articles and reviews, it is very easy to determine which have the best quality among the many brands available. 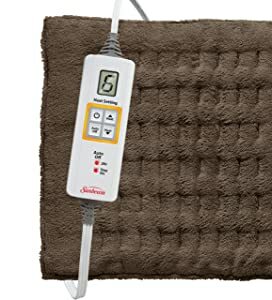 This heating pad is well made but it does not get hot, 6 is the highest setting and it is medium warm at best, I read a lot of the reviews and based on the great reviews I ordered this. I was shocked when I turned it on and it only got warm, I threw the box away before I tried it which was my mistake.